Love this knife set! A friend bought me a set of three chopping knives by Chicago cutlery a few years ago and knew I had to buy the block for our new home! 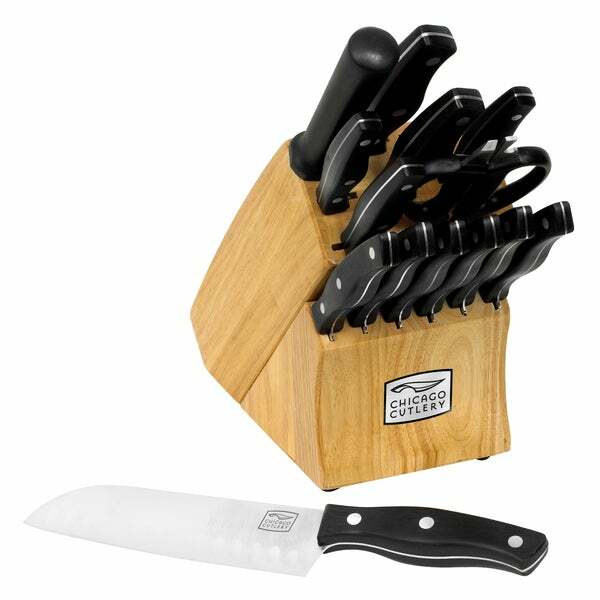 This knife set from Chicago Cutlery features 20 pieces for every cutting need. The high-carbon stainless steel resists rust and stains while the exclusive TAber Grind edge technology provides optimum sharpness. I bought these as a gift for my 23-year-old daughter who complained that after sharpening her cheap knives and using them once, they were dull again. These are made of high carbon steel and will hold the sharp edge much longer. Love Chicago cutlery! They’re so easy to sharpen and hold their edge well they also balance nicely in our hands and are very comfortable to use. Bought these knives for our vacation home. They are a very nice set and look were at on the counter in the butcher block holder. These knives are incredibly sharp! They slice through things like poultry and cheese so smooth and with such ease. Only pain is having to handwash them, but if that makes these knives last and keeps them in top shape, then it is worth it to me. These were so cheap... They started rusting right away. I had to discard them and buy another set of knives of higher quality. Bought these as a gift for my son when he moved out of our house. Decent quality and double tined which is important if you know about cutlery. He's used them for several years now and they've served him well. I love Chicago cutlery, it never disappoints me. This was a gift for my daughter and son-in-law and they love it. This product that I bough as a gift, has turn out not to be a good quality, the person I got it for has told me that after only two months of us started rusting and has lost it sharpness, WOW I could not believed this until I saw it for my self. "Does this block has the in-block sharpener?" Hello jtbrowsing, Thank you for your inquiry! This knife set comes with a knife sharpener. I hope this helps! Happy shopping! "Are the steak knives serrated?" "Where is this product manufactured?" Thank you for contacting us maisiegirl. This is made in China. Please let us know if you have any further questions.